I just love pickles. Sweet, sour, or half sour. Pickle relish. Piccalilli. Cornichons. Incendiary Lime Pickle. Branston Pickle. The more the merrier. I don’t even know when I learned to make them. It seems I always have. I remember having a vat of pickles in the closet of my college apartment. The sweet pickle of my childhood. I make a vat of sweet pickles. 10# is enough for the year - 12 pints. 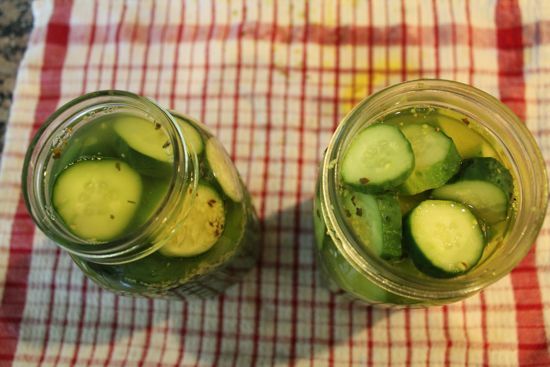 Then I learned about half sour (lacto-fermented) cucumber pickles – so easy to make, one jar at a time. That led to sauerkraut and kimchi for the healthy reasons and so much more. These terrific briny foods work for me. Yes, all that lacto fermenting is wonderful, but when the cucumbers of summer are gone, and it’s impossible to find anything but those suspiciously plastic wrapped seedless things, it’s great to see quarts of homemade dill pickles on the shelf. Lacto-fermented pickles look great in my antique canning jars. My dill pickle recipe is still evolving after at least 30 years of tinkering. There are no fewer than 12 sketched out recipes for dill pickles in my files. There are several reasons for this. Each year, I go to the file, take out all the recipes, can’t remember which one I like, fiddle around with something that is an amalgam of all the recipes. Write nothing down. By the time the pickles have aged, and I’ve tried them, it’s the best pickle I’ve ever made, and I can’t recall what the heck I’ve done. There have been many years of experiments – some of which went weirdly awry. One year, all the garlic turned turquoise blue- a reaction of the garlic with certain metals. One more reason to select stainless steel, enamel or glass/ceramic dishes and cookware when you pickle. Chips are great for sandwiches. Here are some of my favorite tips to ensure success with your pickles. Choose Kirby, Pickling or Persian cucumbers for great results. For chips, you can use larger cucumbers, but whatever variety you choose, they must not be waxed. Once harvested, cucumbers deteriorate really fast. So select carefully – you want them to be firm and straight (easier to pack in the jar) and very very fresh. Once you have them home, pickle them right away. 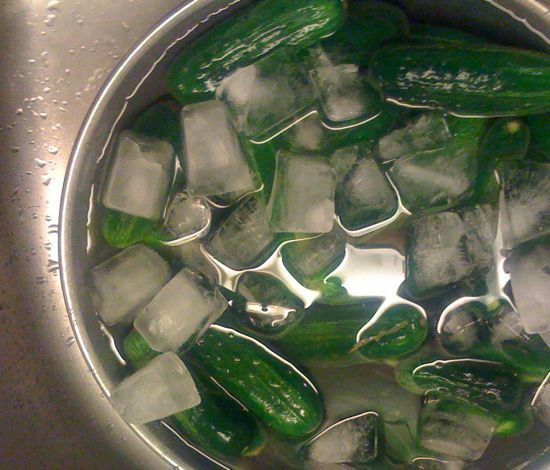 Soak cucumbers in a big bowl of ice water for an hour before pickling. A cooler works well if you are working on a big batch. Make sure the cucumbers are very cold before the hot brine is poured over, because that’s what makes for a super crispy pickle. The blossom end must be trimmed away. There’s something in the blossom end that can soften your pickles. Limp pickles. Yuck. I know it can be challenging trying to figure out/remember which is the blossom end, so just go ahead and trim both ends – what the heck! 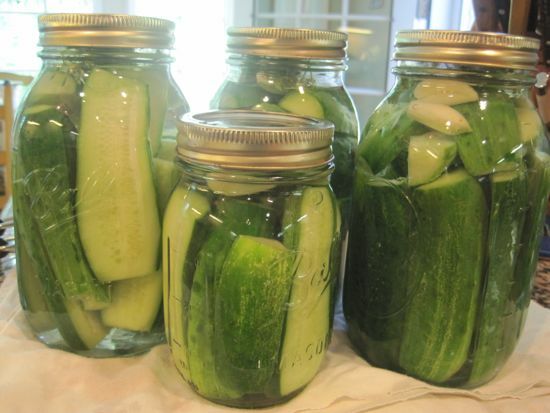 If you have a lot of cucumbers, make whole pickles, spears and chips, separately or all mixed up in the jars. It’s nice to have variety. Use only bottled water. Tap water is full of all sorts of minerals and in some areas, chlorine. These trace elements will really alter the taste of a briny pickle. Use the best salt, not iodized. Sea salt, kosher salt and pickling salt all work well. Let’s Can Together on August 13th! The Ball Canning Company sent me a big box of goodies for National Can-It-Forward Day, a collaborative project with Canvolution (Canning Across America.) On August 13th, we will celebrate preserving by holding canning parties and other canning events all across the country. I’ll be teaching a Tomato Canning Class at The Kitchen Studio in Frederick. A great big giveaway! Thanks to the Ball Canning Co.
To help you host your own Canning Party, I’ve got a Ball Home Canning Discovery Kit to give away. And a funnel, jar lifter, different pectin types, spice packages and more. There are so many goodies in this box, I can’t wait to share it. And I’ll include the recipe packs from my latest classes – for pickles and for jam. Did you know Ball is now making pectins available in larger containers? It’s great for those of us who do small batch preserving – it’s possible to measure out what you need for as few as two jars. Smart. Very smart. I made two jars using the Ball Pickling Mix. Easy to do and so authentic! When I saw the dill pickle mix, I had just come from Norman’s farmstand with a basket full of gorgeous pickling cucumbers, and just had to try it out. After years of fiddling around, these dill pickles smell just right. They need a couple more weeks before I’ll be able to taste them, but I am very, very hopeful. Can it really be that simple? Yes, it can. Leave a comment, tell me how you feel about pickles! I’ll use Randomizer to choose the lucky winner on August 1st. You’ll have your canning kit in time for National Can it Forward Day. And here are some recipes you might want to try on August 13th. C’mon, let’s Can It Forward! 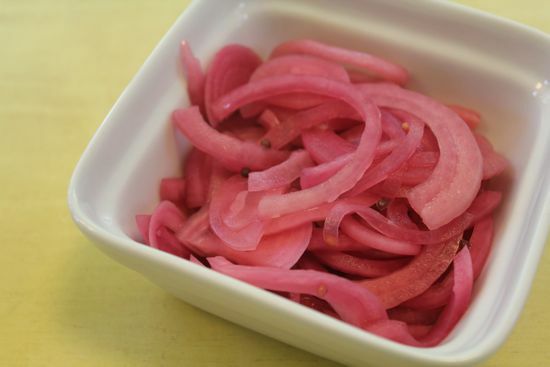 In the meantime, without any canning at all, you can make these quick pickled red onions and serve them on just about everything. Tacos. Burgers. Eggs. Sausages. With cheese. As a garnish for black beans. These “quickles” take about twenty minutes to put together. They hold in the refrigerator for weeks, but they never last that long in my house. Thank you, Neven Martell from the Washington Post for introducing me to the word quickle. It’s made me giggle ever since. Slice the onions into very thin half moons. Put the onions in a glass or ceramic bowl, or pack them into a clean pint jar. Add the pickling spice to the jar, and crushed red pepper, if desired. Heat the vinegar, water, salt, sugar in a saucepan until the salt and sugar have dissolved and the brine begins to boil. Pour the warm brine over the onions. Let them sit for 20 minutes or even an hour. And they’re ready to serve. I love pickles! I can’t wait to try the quickles. They will be great on grilled sausages! I could live on sour pickles, and you’ve inspired me to make a new batch this weekend, along with some quickles. I’d love to know what’s in your pickling spice. Hillary, I meant to include it! After your comment I added the pickling spice recipe at the end of the post. Thanks, Cathy! Looking forward to trying it! I love half dones. I also love dills. Hell, I lve it all! As a child, I loved spotting giant dill pickles in enormous glass jars on the countertops of gas stations while on vacation. I was often in trouble for making quick work of any and all pickles that entered the house. And yet, it’s just this year that I attempted to make my own pickles. It worked! I just can’t get enough of pickles and am excited to be learning more about canning so I can make my own. My fridge is already so stuffed with pickles (dill, bread-&-butter, scapes, ramps, sour cherries and sugar snaps) but I don’t think I can resist trying these onion quickles! And the cornichons are just starting to come in. As usual you are an inspiration! I absolutely love pickles!!! I am growing 6 plants each of 4 different cucumbers just so I can make pickles!! I remember going to NYC and going to the Jewish pickle shop with all there barrels full of briney veggies!!! Yum, I love pickles. One of my favorite snacks and I’d love to be able to make them myself. So many cucumbers, so little time! Like you, I’ve been making pickles for more years than I care to admit. Everything is fair game for pickling in my book. I’d be happy to do some pickling and canning on that day. Should be a riot! Great idea, thanks for putting it forward. Half done pickles were on the list- and some friends and I had talked about have a pickling weekend after I made your pickled asparagus a couple of months back…. Sounds like we will be doing it on National Can it Forward Day! My wife and I love to can. Thanks to our CSA (Johnson’s Backyard Garden) and their bumper crop we ended up canning about 80 lbs of tomatoes. They are currently harvesting okra and I have several things that I want to try with those gooey veggies. Thanks for the giveaway! I love pickles! Half sours are my favorite- but I love all kinds. I’m another pickle lover. I keep picking up random dill pickle recipes on non-canning specific sites that don’t work but I have built up a good library of exciting and reputable canning books and canning sites so I think I can finally use a recipe that works. I would love to win this. I don’t think I will get to do pickles this year. Most of the cucumbers burned up in the heat, here is Oklahoma. I am hoping my tomatoes will make it to can more pasta sauce and salsa. I love pickles. This year I have made three types of pickles so far. I made quick dills, fermented dills, and your recipe for Luvey’s Eight Day sweet pickle chips. All are excellent and satisfy my family’s craving for pickles on a daily basis. 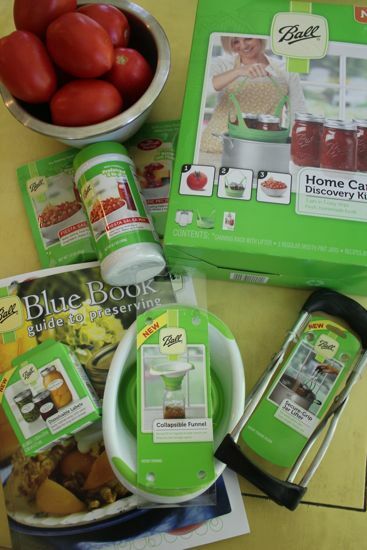 I would love to win the Ball kit and add to my canning tools collection. Thanks for such a great site and such tasty recipes. Mmmmm…pickles…love making pickles. Just started getting pickling cukes, first two jars are processed and pickling away in the basement 🙂 Yay! Dills and Bread and Butter, plus trying sweet for the first time this year. Great giveaway! I am obsessed with pickles this summer. 🙂 My most recent pickles were fennel pickles that are insanely good on grilled cheese. Before that, I made some of my dad’s pickles – cukes, red onions, and tomatoes, and not too tart so you can pile them way high on sandwiches. I just LOVE that phrase. Pickle it and they will eat. Love pickles of all sorts. And the small batch Blueberry~Ginger Jam came out great! I am a pickle girl all the way, and it looks like you are the go-to girl for these cucumbers. I’ve made pickled beets, picked onions, and pickled cucumbers so far, all “refrigerator” style. I’ll have to try making some with Persian cucumbers–I live in a neighborhood with lots of Armenian grocery stores and they sell those small, sweet babies there. What are you making for Can It Forward? I want to try something new! Oh, I love the idea of pickled onions. I’ve been working on eatting the ones that my sister added to her pickled eggs. super yummy. I’d love the set to get started since right now it’s just my sister canning. I adore pickles and quickles! I have been going pickle crazy with The Joy of Pickling. I’m thinking I need to make some quickles today. Thanks for your post . Always nice to have kindred kitchen spirits in cyberspace. I always have something pickled in my house! And a surplus of jams and jellies. We depend upon having sweet pickles and dill pickles, always. Dilly Beans are also a must have. From my cherry trees we have an abundance of cherries. I also have red currants. We have two grapevines that grow every year like they’re on steroids and all I do is trim them. We have apples, crabapples, plums, pears, and a large vegetable garden every year. And although my husband will never forgive me for bringing them home, we always have Jerusalem artichokes. Because of all the rain in the Pacific Northwest, our garden this year is like a jungle. I have four cucumber plants just starting to bear, two zucchinis, potatoes, parsnips, carrots, beans, tomatoes, peppers, beets, corn, celery, lettuce, Tuscan black kale, and the list never ends. August and September are my busiest months because I can, can, can. And this year I get to teach my new daughter-in-law how to can! Life is good! I’ll join the picklers anonymous group, too! I continue to make Candysweet Pickles (lime pickles with LOTS of green food color) for my family and have branched out into Fire and Ice, too. Several years ago, I purchased a book of heirloom recipes from Smith Hawken when it was going out of business. Sure enough, there was an heirloom recipe (Crystal Pickles) that I had to try. What I’ve found is that most people have ONE or TWO pickles that they love — and the rest are only eaten when the REAL pickles are gone. I’m still hopeful that my cucumber crop is going to make it this summer — otherwise it’s by the cuke (the farmers’ market people in the Cincinnati area RARELY sell cucumbers by the pound – even if I want 7 lbs!). Perhaps I should host a canning party – so that I can pass this along to my interested clientele (i.e., children and sisters). . . . .
I’m headed to the farmer’s market today to find something to pickle! I’m new to canning but darn if it hasn’t become an obsession! My son is nuts over all things pickled. Ever seen a 10 year old eat fork fulls of sourkraut? He even uses the brine for “pickle air freshener” in his room! My little weirdo and I will be attempting your dilly beans today. Thanks for all your inspiration! This is my first year canning. I have made 2 batches of strawberry vanilla jam, 1 batch of strawberry rhubarb jelly and 3 qts. refrig. dills. I’m anxious to try other pickle recipes once my cucumbers start coming in. Maybe even try pickling some other vegetables from my garden. Thanks for the recipe. I LOVE PICKLES and these photos are making me hungry for canning. As soon as payday comes, I gotta go get supplies so I can start learning. Guess what my first run will be at…. PICKLES! Pickles are a food group of their own!. I love all types, sweet, dill, bread n butter…doesn’t matter. As long as it’s a pickle (I don’t like cucumbers, lol). Thanks for sharing you recipes above. I love pickles and also thai cucumber salad. I use Ball pickle crisp. Works like a charm. I love your luvey’s pickles! I should make some more this weekend! I love pickles! I have been pickling radishes lately. MMMM! I love pickles. I have not been able to make many this year b/c of the drought my pickling cucumbers did not come up. So next year will know to plant more. I am in the process of making pickles right now. I grow Kirbys every year because we like them better than other cukes. I am using the Ball recipe with changes for the Bread and Butter pickles. No tumeric, although I have it, whole cloves, green peppers from my garden, mustard seed, black and yellow and maybe corriander. There were four big ones (hey hid from me) so I am going to slice some onion and the cukes, salt and let them drain, rinse and squeeze them, add garlic, dill and sour cream. Thanks for the canning help. I really love pickled okra – I know it’s not a pickle – but it is pickled! 🙂 Right now I’m working on some cucumber relish – again not a pickle – but it is pickled! I’m fairly new to canning and looking forward to trying pickling this summer! I love all pickles but dills the best. I have a soft spot in my heart for bread and butters since I have lovely memories of eating them as a child with my mother. My hubby and boys love pickles. Whether it be those gigantic pickles at the gas station or some from home, my hubby can eat them up. This would be a great kit for me to win as I am just entering the canning arena! I Love Dill Pickles. My grandmother used to make the BEST Dill pickles. I just wish I would have gotten her recipe. Will be trying your pickles next! I’ve been canning for years, and pickles are one of the first things I tried. I make then every year, my family can’t wait until the first jar is ready! I dream of pickles any kind any way. Duke relish on crackers till I decide what I’m really hungry for! I just found your blog and LOVE IT! I love pickles – especially bread & butter and sweet midgets. YUM!! We LOVE pickles! I make a recipie passed down from my great great Grandma. Its round steak wrapped around bacon and a dill pickle. I just haven’t had luck making a good crisp dill pickle.. I can’t wait to try some of your recipies this year!! Love your blog!!!! 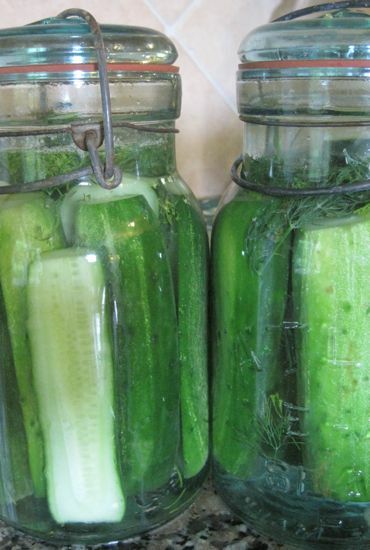 I love a great dill pickle and can’t wait to try some of your tips and recipes! I’ve just started canning things and I think I’m ready to take on pickles. I’m used to making refrigerator pickles like my grandmother, but I’m excited to try some of your recipes to make pickles to can! I love pickles! I will pickle anything. I pickled blackberries one year just because I could. My nephew ate them and said that I should use the brine for salad dressing but the blackberries were just okay. Although he did eat them all! Oh well teen age boys! I have my first batch of fermented pickles doing their thing down in my basement. I am being very patient and letting them go until mid-August. I am hosting a canning party at a friend’s house this coming week and we are introducing one of the members of our knit group to canning. The rest of us can although I am considered the most experienced. And I am in your class in Frederick. If I win, the kit will go to the new canner in our group so she has no excuse. I’ve never canned before, but I’m ready to learn how! I would love to be able to do the perfect dill pickle, but I’m so afraid they’ll turn out like Aunt Bee’s! I’ve spent this summer making refrigerator pickles, because I knew I’d use them the next day or week for cold suppers. Very nice with sandwiches…. green onions and snap pea pods are my favorites. I love pickles, all kinds! I am anxoiusly waiting for the cukes and beets to mature in my garden so I can pickle them. I’ve pickled carrots, boothbay beauty cukes, dilly beans, strawberry balsamic jam and beets. I’m beginning to run out of room and the season is just starting here in Maine! Viva la Canners! You know, I never liked pickles until I started canning. NOW I CANNOT STOP. 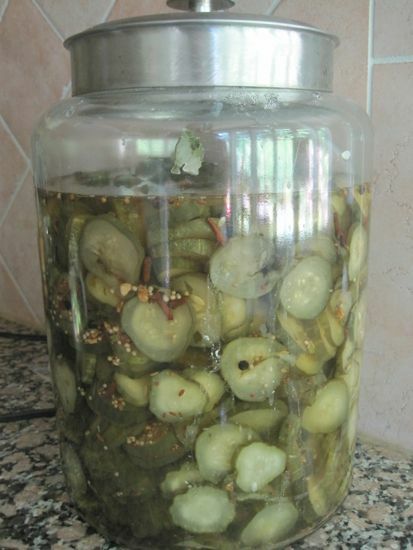 Great pickle recepies we just put up 2 jars yesterday.I will be making the Quickled Red Onions to add to my fish tacos. Thank you for all this great food and fun. I love half sour pickles. They remind of going to the deli with my grandmas as a kid. And pickled onions, radishes, carrots . . .
My grandson loves pickles. I’ve never made pickles before but I am excited about trying out the pickling spice you have posted on this blog. Thanks for the tip about bottled water. I recently pickled some jalapenos. I used tap. I hope they come out. I’m loving my grandmother’s recipe for sweet pickles. I made zucchini pickes recently that were fantastic. I wish I had gotten some pickling cukes but I just didn’t make it this year. Love pickles….oh yes! Just did curry cauliflower, dills, sweets, and I’m trying to figure out a tomato pickle….on that one I’m thinking cherry tomatoes! What a fab give away! I would LOVE to see a post on how you make sauerkraut and kimchi. I made some sauerkraut last year but was less than pleased with the results. I would also love to have kimchi at the ready all the time. I’m making pickles tomorrow and LOVED reading your tip on what makes for a crunchy pickle. Thank you! I would love to win. 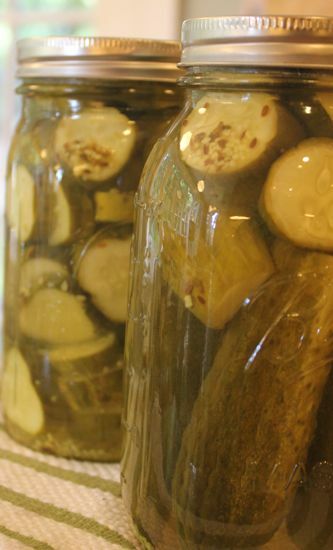 Pickles have been a favorite to make for over 20 years. I started with zucchini pickles. Dill pickles, pickle relish, sweet gherkins soon followed. I’ve been making refrigerator pickles this summer as I don’t seem to have enough for canning. I should plant more seeds. That could fix my quantity problem. I love fermented pickles! I really want to learn how to make them myself. And other kinds of pickled vegetables as well, they remind me of my grandparents. It took me a while to start loving pickles but at some point in high school I got it. I really love tiny little french cornichons! Dill pickles bring back sweet (sour?) memories of my grandpa, who grew and pickled his own. Pickles … oh, I used to NOT like them. Now- wow- there are times when only a pickle will do. A friend makes pickles every year, and I am always in awe. But you make it seem so easy! Thanks for the chance to be one step closer. I’m a bread and butter pickle gal. I made 10 quarts last year and gave too many away. I made them again this summer – and my daughter told me that I could not share them – they are for the family only! I absolutely love pickles! I’ve been meaning to get a ball set to make some but haven’t had the time or moula to do so as of yet. I’m hoping for it to be a early x-mass present for my self this year. I love, love sour pickles with lots of garlic, and have high hopes for the day my cukes come ripe. Thanks! I love pickles but have never made them! My husband just learned about lacto fermenting so we plan to mess around with some recipes this summer. Yum! I’ve already made Zucchini Butter with some of our bounty from the garden and I’m getting ready to put up my first batch of pepperoncini peppers so this fits right in! I can’t wait to see what goodies everyone comes up with for National Can It Forward Day. Thanks for more inspiration! Love pickles and endless exploration thereof. Last effort: pickled garlic scapes. Pickled golden beets, into the jar of spiced brine today, cherries, tomorrow. Yahooo! I grew up on Armenian pickled cauliflower and green tomatoes. These were always a favorite treat when visiting my great-grandmother. Have been trying to recreate her recipe. I often get sidetracked into other pickle ventures, though – grapes, beets, onions, hot peppers, kimchi, sauerkraut, turnips, anything abundant, fresh, and at it’s peak. Great to find more recipes to try and helpful tips here! Thank you. Thank you everyone for your great comments and for your love of Pickles!!! New post coming soon. I’ve been traveling and thought a few days off would be good for the soul. happy august! Hi Helen, I would think that very thinly sliced cucumbers would work. The quick in the quickle onions is definitely helped along by the very thin slices. Give it a try and report back, ok? I just finished making fermented dills for the first time. It was a little scary at first but the results are awesome. To be clear, I am going to use the word “quickles” every day for the rest of my life. The end. this is the most inclusive pickle blog EVER! Our farm share has been humongous this year so I generally pickle what we can’t eat: radishes and now beets. However, I am a chicken (I took microbiology in my recent past) when it comes to actual canning. I wish I could make your class. I’ll will read up on canning and hopefully be able to participate on 8/13, I certainly have a surfeit of vegetables to can! Can’t wait to try the Kimchi recipe. I have cabbage waiting. One of my best friends who has passed away loved pickling. She would have loved having a can it forward party. I’m looking for one to go to.